candidate Ro Khanna at his campaign event in May. CONGRESS | 17TH DISTRICT | It’s one race Democratic congressional candidate Ro Khanna did win. On Saturday, Khanna married long-time, on-and-off girlfriend, Ritu Ahuja in Cleveland. The wedding announcement appeared in the Sunday New York Times “Vows” section. The shedding of Khanna’s bachelorhood may bring a different dynamic to next year’s potential hard-fought rematch with Honda. But, the road to the altar was also far from easy for Khanna, according to his new bride. She said there was something unique and special about him. Later, though, she suspected Khanna was angling for a way way back to New York for a second date. Khanna subsequently asked her to spend the rest of life with him, she said. “Knowing Ro now, that wasn’t as surprising as it was at the time.” She admits now he had a vision for their future they should could not see then. But, the relationship fizzled early. Nineteen months after their second relationship, they reunited on long-distance relationship, but again, went their separate ways after one year. After four years, Khanna asked her out again during a blizzard in New York City. “I began noticing he had become a more certain version of the man I had remembered,” she added. Khanna’s long campaign for the Seventeenth District, while successful, came up just short of upsetting the incumbent Honda last November, but Ahuja says, the campaign strengthened her bond with Khanna. Shortly after the fall election last year, Khanna proposed. In a traditional Indian wedding, Khanna and Ahuja wed last Saturday at Severance Hall in Cleveland, the home of the city’s symphony. 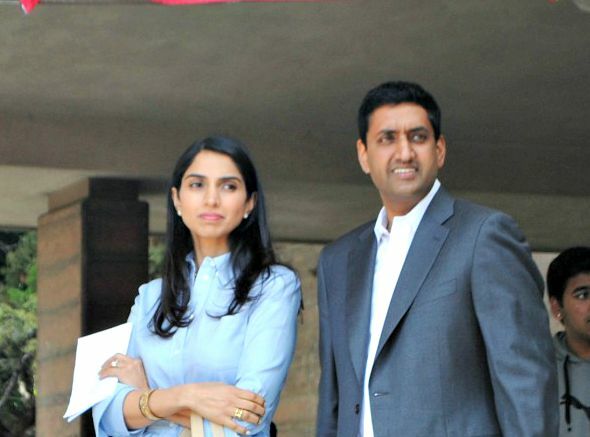 Posted in 2016 Election, CA17, Cleveland, congress, Mike Honda, New York Times, Ritu Ahuja, Ro Khanna, wedding. Bookmark the permalink. So Khanna got married. Big deal, it (marriage) happens even in the best of families. this is an odd story, why is it newsworthy and what does it have to do with his campaign?